The 56th London Film Festival "kicks off" tonight, and as the WHOLE ENTIRE WORLD turns its gaze to London again for the capital's second-biggest event of the year (after the opening of Skyfall and well above the so-called "Olympics"), The Incredible Suit will once again endeavour to review approximately seven percent of the total films on offer in order to help you decide what to fork out for. Except by now most of the tickets have sold out, which makes you wonder why I bother. Here we go! Scandinavia continues to show the world how to make gripping, slow-burning drama with this tightrope-tense tale of a kindergarten teacher whose life spins out of control after a wild accusation turns him from community pillar to social pariah. Mads Mikkelsen quietly gets on with his successful quest to be completely ace in absolutely everything, while the supporting cast do an equally great job of acting from behind huge Danish beards, EVEN THE MEN LOL. 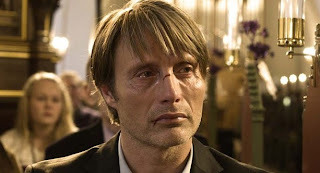 And while the film requires you to suspend disbelief during a couple of awkward contrivances (Mads doesn't protest his innocence very strongly; everyone immediately assumes he's guilty despite a total lack of evidence), it makes up for it by allowing you to develop any number of unpalatable theories and then refusing to disprove any of them. Devastating. Remember all those clues scattered throughout The Shining which proved beyond doubt that Stanley Kubrick faked the moon landings? Or the way in which the film is a blatant allegory of the Holocaust / genocide of the native American Indian / rise of Simon Cowell? No? Then congratulations, you're a normal. Nevertheless, those theories and more (except possibly the one about Simon Cowell) are explored in this documentary about conspiracy and coincidence in Kubrick's horror masterpiece. 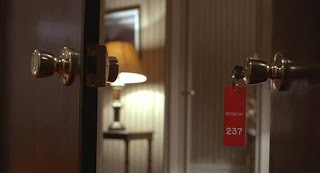 An interesting accompaniment to The Shining but nowhere near in its league of filmmaking (obviously), Room 237 gives us the testimonies of five people who have watched the film so many times that their brains have rebelled and started showing them all sorts of hidden meanings buried within it. None of them are remotely convincing, and annoyingly much of the "evidence" comes from the US cut of the film, with which most of us in Blighty are unfamiliar. Room 237's biggest problem is that we never see the crackpots contributors who so firmly believe their theories; we only ever hear them in voiceover, which makes it easy to lose track of which insane hypothesis we're supposed to be following at any given time. Still, there's some troublingly hilarious stuff in there, not least of which is the unexpected appearance of the Overlook Hotel manager's massive erection, which will now be impossible not to see on subsequent viewings. Shot on 16mm film in a style as freewheeling and independent as its lead character, Beasts Of The Southern Wild is genuinely like nothing you've ever seen before. Part social commentary, part fantasy, it's a magical, meandering fairytale flooded with fear, anger, love and the instinct for survival. It's entirely childlike in its execution and aimed squarely at the mischievous, wide-eyed scamps buried underneath the layers of responsibilty and cynicism that define adulthood. 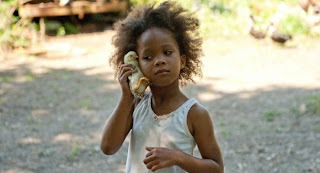 The film and every single thing in it orbit six-year-old Hushpuppy, breathtakingly played by titchy but indomitable Quvenzhané Wallis with more preternatural passion than most actors manage in their entire career, and the supporting cast - most notably Dwight Henry as her father Wink - are almost her equal. But despite all the brilliance and individuality on display, Beasts Of The Southern Wild failed to move me as it clearly intended to. The focus on atmosphere and mood is eventually overwhelming, and the desire to find out what happens next gradually dissipates when it becomes clear that the film isn't interested in anything as pedestrian as a plot. Simultaneously wondrous and dissatisfying, this is perfect film festival fodder. It's destined to flounder outside its comfort zone of the cineaste circuit though, so if it sounds like it's up your alley, see it now while you can.